Last Saturday I took part in a field trip with the Northern California Geological Society, looking at conglomerates down at the San Luis Reservoir, in the mountains between Gilroy and Santa Nella. It sounded kind of dry and remote and obscure, but I always have a good time, and I got new insight into Oakland’s rocks. First a quick refresher: the Oakland Conglomerate is made largely of cobbles in a matrix of sandstone. It crops out in a long belt starting in Montclair, crossing Shephard Canyon and stretching along Skyline Drive across Lake Chabot into Hayward and beyond. Here’s an exposure above the Montclair Railroad Trail, about as good as you’ll see it. The Oakland Conglomerate dates from late in the Cenomanian Age of the Upper Cretaceous Epoch, a period of geologic time between 100.5 and 93.9 million years ago. At that time the west coast was a large subduction zone, rather like the west side of South America today. Eastern California and Nevada was boiling with volcanoes, with big bodies of granite rising up beneath them. Huge amounts of sediment eroded off these rocks were delivered down rushing rivers and dumped into a deep-sea trench near the coast. 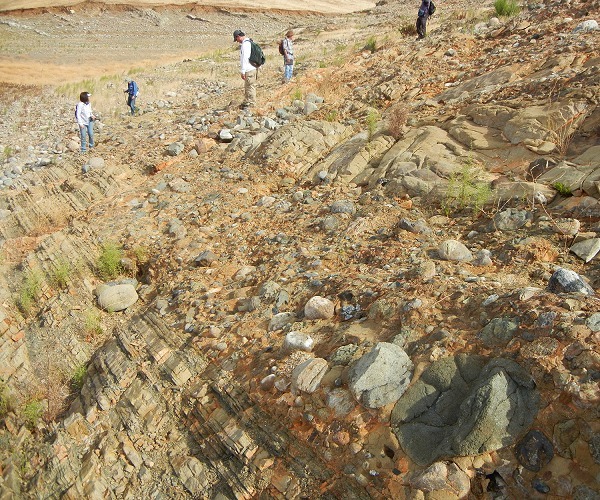 Conglomerate is a typical product of this high-energy setting as coarse-grained sediments are deeply buried. 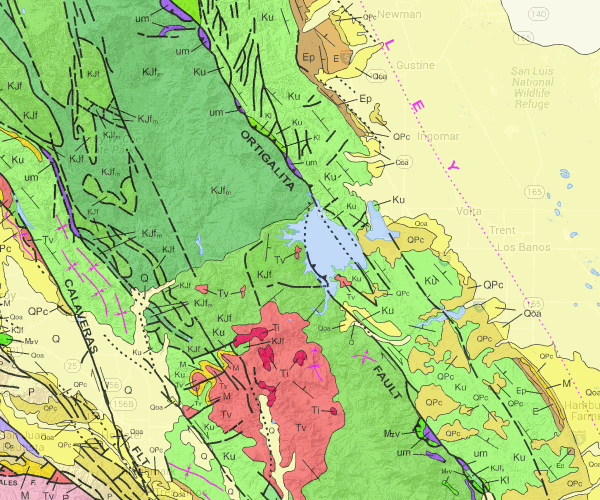 Here’s the geology of the area, from the online state geologic map. The reservoir is at the center. The three dashed lines in the reservoir are strands of the Ortigalita fault. We walked along the shore just east of the middle strand, starting at the Romero Visitor Center. Here, just like in Oakland, the set of rocks known as the Great Valley Sequence (light green, labeled “Ku”) is tilted toward the east and exposed edge-on in the hillsides. That means the oldest rocks, at the bottom of the pile, are exposed along the western edge. The tilted beds of these rocks are subtly visible in the grassy hillsides in this view north, just as they used to be in Oakland’s hills before we let the trees take over. 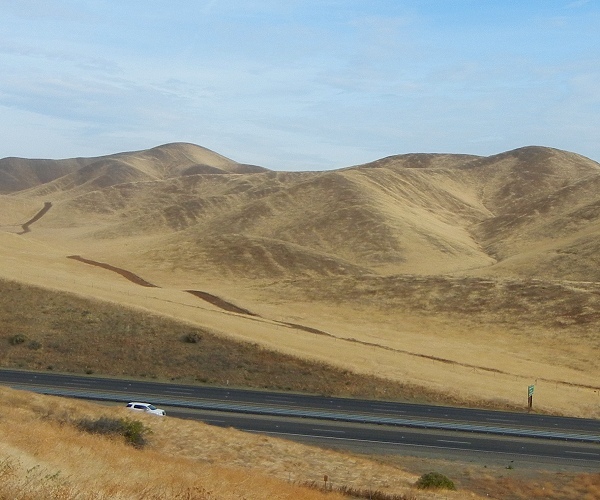 Also, just like in Oakland, the Great Valley Sequence is shoulder to shoulder with Franciscan rocks across a major fault. In Oakland the two bodies of rock are interesting examples of their type. At San Luis Reservoir, the two bodies are world-class examples of their type. The Franciscan rocks there are jadeite-bearing meta-graywackes that are famous in the literature. The Great Valley rocks there are the biggest conglomerates in the whole state. They aren’t yet famous in the literature, but our field-trip leader wants to raise their profile. San Luis Reservoir is a storage tank, not a lake. It’s pumped full and drained under human control to regulate irrigation for the San Joaquin Valley. As the water has risen and fallen over the last 50-plus years, it’s washed the soil off the rocks and left fabulous exposures. Here’s the view from the visitor center, with the dam on the left (east). You can walk all over these yourself, just as we did. 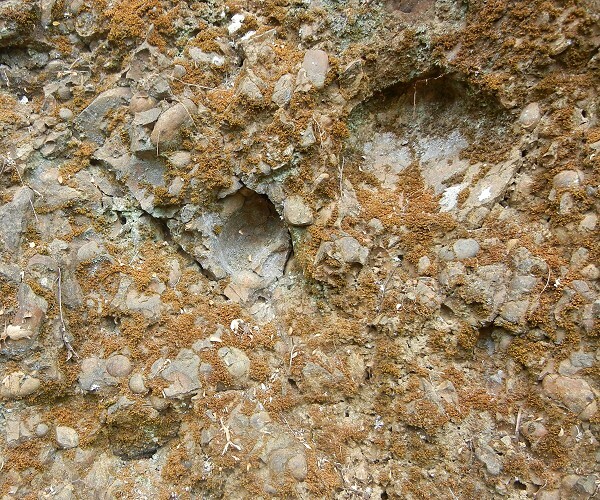 Oakland’s conglomerate generally contains stones of pebble size (16 to 64 millimeters) or cobble size (64 to 256 mm, plum to basketball size). 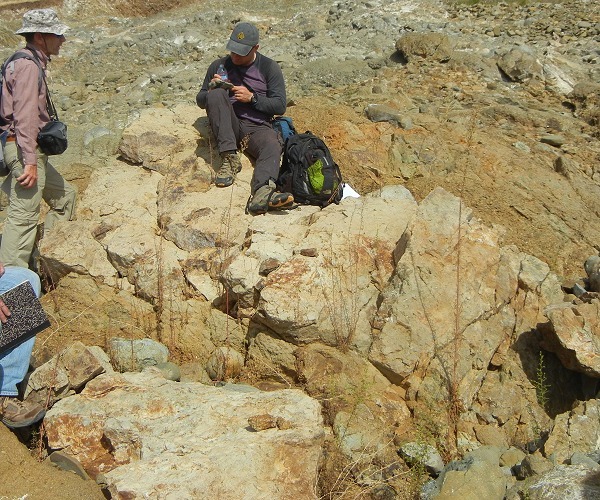 The San Luis conglomerate has stones of boulder size, which is pretty phenomenal. The biggest of these are measured in meters. Our trip leader, Todd Greene of Cal State Chico, helped us picture this area as sitting at the mouth of a big, long-lived submarine canyon like the Monterey Canyon off our coast today. Torrents of well-rounded river rocks roared down its channels to pile up in a deep-sea basin. So the biggest rough-edged boulders, like the one he’s sitting on, represent crags that have fallen from the sides of the canyon. We worked our way along the shore, moving down through more than a kilometer of conglomerate beds. Near the bottom was a thick unit of modest-sized stones, something very much like our Oakland Conglomerate. Imagine if we could see exposures of this quality in Oakland. Oh well, everyone needs a daydream. This entry was posted on 26 October 2015 at 8:02 am and is filed under Oakland conglomerate. You can follow any responses to this entry through the RSS 2.0 feed. You can skip to the end and leave a response. Pinging is currently not allowed. Are conglomerates a source of fluvial(?) gold, as are water-worn rocks in unconsolided ~matrix~? Yes. 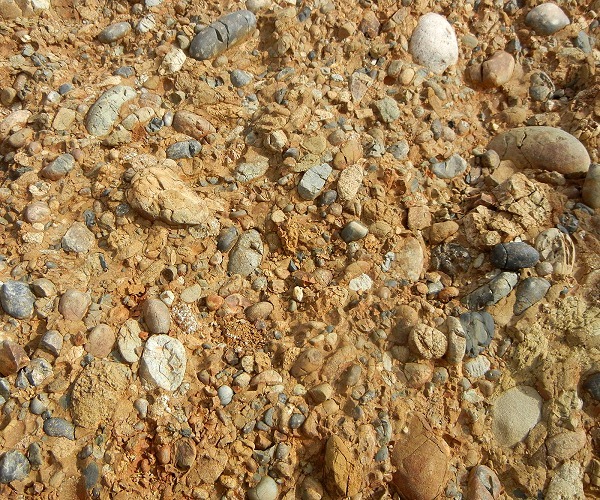 The fabulous “Tertiary gravels” of the northern Sierra Nevada are prime examples. They are poorly consolidated, terrestrial conglomerates. 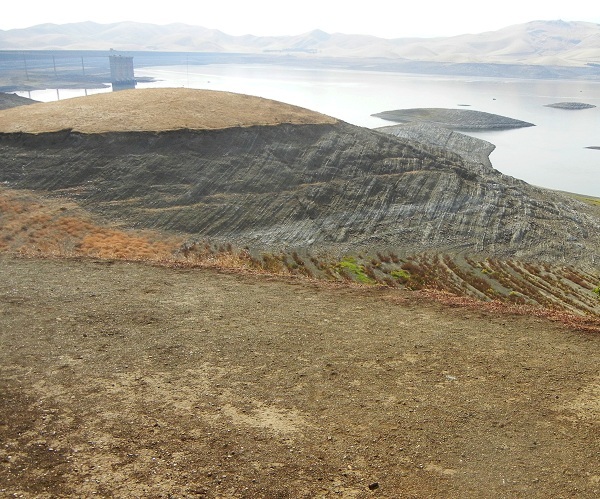 The rocks at San Luis Reservoir are deep-marine conglomerates that are many times older, so they shouldn’t be expected to be anything like the Sierran ones. But I would never say never when it comes to gold. You can find gold almost anywhere if you look hard enough and don’t expect much. There’s a small USGS report finding tiny amounts of gold in San Mateo County beach sands.